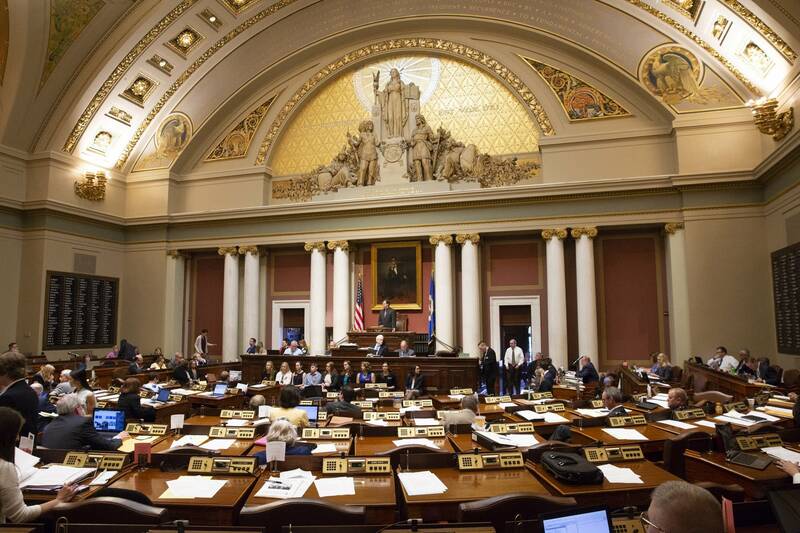 An opening skirmish in the debate over health costs in Minnesota involves a program used to buy down expensive insurance claims, and lawmakers must decide quickly whether to extend that state-funded effort that delivered short-term results. A couple years ago, the Minnesota Legislature was scrambling to tamp down soaring health insurance rates for people who bought coverage on the open market. Lawmakers approved hundreds of millions of dollars in rebates to chop the cost of monthly premiums. Then they set aside another $570 million to reduce the risk for insurers. The "reinsurance" program had the state pay a large share of the medical costs once a policyholder's claims exceeded $50,000 and until the bill hit $250,000. "The fact is Minnesota's reinsurance program has worked," said Kathryn Kmit of the Minnesota Council of Health Plans. She said the payments allowed insurers to hold down premiums the past two years. "Everyone in the individual market, everyone has benefitted from lower health insurance premiums as a result of this reinsurance programs," she said. Now Kmit's group and others are trying to get lawmakers to extend the program, and they say it has to happen fast. Health plans will submit their proposed 2020 rates to regulators by the end of March. Slightly different bills to renew the program advanced Tuesday through committees in the Republican-controlled Senate and Democratic-led House. Rep. Laurie Halverson, DFL-Eagan, said the bill is key to keeping the market stable. "We are about to fall off a cliff if we do not extend it. That cliff will lead to higher insurance premiums in the individual market," Halverson said. "It will lead to more Minnesotans being uninsured." House Republicans were quick to criticize DFLers for a change in tune on the bill after voting and campaigning against the original reinsurance plan. "We welcome their newfound support for reinsurance," said Rep. Tim O'Driscoll, R-Sartell. "It was the right thing to do and the program has helped lower premiums for Minnesotans two years in a row." Senate Commerce Committee Chair Gary Dahms, R-Redwood Falls, said it's just a matter of pushing out the expiration date a few years because there's money left in the fund and other federal assistance coming in. An actuarial analysis shows that nearly 1,865 individual claims were covered by the program in the first nine months of last year at a total cost of $84 million. Dahms said the final 2018 tally could reach as high as $150 million once all affected claims are tallied. Some questioned whether the cost is worth it. "For the amount of relief that we're giving insurance companies, are we getting enough relief for Minnesotans?" asked Amanda Otero, a health care organizer with the group TakeAction Minnesota. "The premise behind this bill is we can't afford not to do this. We're wondering if we can afford to do this." TakeAction is a grassroots group that has become a force on the political left. The Minnesota Nurses Association has also objected to the bill on the grounds that it's a short-term fix to a health cost problem that demands bigger solutions. Rep. John Lesch, DFL-St. Paul, argued reinsurance does nothing to attack high costs of care. "I still don't understand why we are doing reinsurance," he said. "It's like putting on a flak jacket to walk through a minefield. It doesn't feel like it will have that great of an effect, other than delaying the inevitable." Dahms took issue with characterizations that the program is a giveaway to insurers because money only goes out in response to specific claims. "This is not a padding of the insurance companies. This is directly reducing the cost of the insurance," he said. The health care debate will come into clearer focus next week when DFL Gov. Tim Walz releases his first budget proposal. Walz hasn't said whether he backs the reinsurance extension. "Health care stability is critical in order for Minnesotans to plan for future costs," Walz said in a statement when asked through a spokesperson for his position. "My office remains in contact with stakeholders in the health care community as we prepare to release our budget next week." Sen. Jeff Hayden, DFL-Minneapolis, said it's misguided to view reinsurance in isolation. He's joined Walz in a call to open up the state-managed MinnesotaCare program to more people in places where private insurance options are limited. "They all work together," Hayden said of the state's health care programs. Hayden said Republicans could complicate things by letting a 2-percent tax on medical procedures expire at the end of the year. Walz and Democrats want it maintained. "We work in a health care ecosystem that is dependent upon each other in order to work," Hayden said. "If we don't repeal the sunset of the provider tax, that's a $700 million hole per year that we don't have to pay for health care."